Ah, motivation. We all seem to need it to get stuff done these days. Finding motivation to practice music can be difficult at times. That is why I want to move away from “motivation” as a way to practice. Relying on a motivator often means relying on something external. There are days where I don’t want to practice, because I can’t find anything to motivate me. Discipline, however, is more consistent than motivation. Discipline should be the main factor in you practicing. Motivation is the state or condition of having a strong reason to act or accomplish something. Discipline involves an activity that helps develop a skill. Both motivation and discipline *can* be applied to music and musicians, but discipline requires nothing more than you and your instrument. Motivation requires something like an upcoming lesson or concert. That event gives you the desire to practice so that you can do well. The problem with this is that we don’t always have a concert or lesson in the near future. That doesn’t mean we shouldn’t practice. Discipline, like daily practice, will help develop your playing each day. No need for a concert or lesson. If you have never done disciplined practice, it can be hard at first. Discipline has to come from inside you rather than something external. Your desire to improve as a musician is a great start, but you need to make it a routine. For example, every time you use the restroom, you wash your hands. Right? That is discipline. We have trained ourselves to wash our hands before leaving the restroom. You can practice in that same way. Not when leaving the restroom, but each day. Find a time to practice, even write it down on the calendar. Think of practicing as something you just do. It is part of your day, just like washing your hands. When you start practicing by discipline instead of by motivation, it can be hard to get in the groove. Reminders can be anything. It can be an alarm telling you it’s time to practice. You can also use paper reminders, like on your mirror or music stand. No matter what kind of reminder you use, make it something that does inspire (or even motivate) you. In the beginning, it is hard to practice based on discipline alone. Adding in one or two outside factors can help you. Soon enough, you will be practicing without those outside motivators. No. Motivation can be a good thing, and it can be a great way to get you to practice. Relying solely on motivation, however, is not good. There will be many times where you are not motivated by anything to practice. If that is the case, it will be a lot harder for you to pull out your instrument than if you also had the discipline to. Finding motivation to practice is a nice thought, and it can be helpful. Motivating factors, like performances, can help you build that discipline necessary. It can help you become disciplined to the point where you will continue to practice after that next concert. Motivation can be a great way to get anything done, but it should be accompanied by discipline. I’ve talked all this time about motivation and discipline to practice, but I haven’t mentioned why we practice. As musicians, we should always want to improve. Odds are, you are not the best performer on your instrument. Therefore, you can learn from someone. You can learn what the greats have done to hone their craft. Just as how a student studies, a musician must practice. It is how we can learn and grow. Practice allows us to play new and increasingly difficult repertoire. Without practice, we would be forever stuck as a beginner. In the end, practicing isn’t about motivation or discipline. It’s about bettering yourself, both as a musician and as a person. Music allows you to express your own creativity. You can even form your own community with other musicians. Practicing is a means to an end for musicians; it is how you meet or even exceed your goals. Some days, you will be really motivated to achieve those goals. Other days, discipline will be all you have. So while music is something to be enjoyed, we cannot rely on our love for music. We will not always be motivated to play or practice. 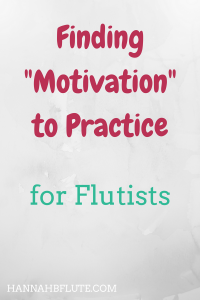 What are your thoughts on finding motivation to practice? Do you prefer discipline? Let me know in the comments! Be sure to subscribe below for a free Music Affirmations printable!